Advanced Football Analytics (formerly Advanced NFL Stats): Is Devin Hester Worthy of the Hall of Fame? But kick returns aren’t all they’re cracked up to be. As exciting and spectacular as they are to watch, they don’t use much clock time or real time, keeping defenses on the field for consecutive drives. Also, the outcome of a kick return isn’t just touchdown-or-no-score- at- all, because offenses will score on a healthy proportion of drives anyway. From the point of the average return, at about the 27-yard line, offenses score TDs 18% of the time and get FGs another 10% of the time. Valuing a field goal at 3/7 of a TD, that’s effectively a 22% TD rate. Keeping that in mind, Hester’s real impact would be diminished somewhat, going from 11 TDs above expected to perhaps 8 or 9. That’s 8 or 9 ‘touchdowns added’ sprinkled over 74 games and nearly five seasons. That’s not a very big impact. Compare that to someone like Deion Sanders, who was no slouch as a returner with 8 total TDs over 367 attempts, but who was also a game-changing defender. Think of how many TDs ‘saved’ Sanders could be credited for. How many drives that otherwise may have been touchdowns did Sanders help kill either by directly defending a pass or deterring one? Heck, Sanders scored 10 TDs himself off of interception and fumble returns alone. Rod Woodson, a recent Hall-selectee, had 13 TDs off of turnovers. Looking through the lens of expected points added can clarify things by measuring performance among the various dimensions of the game with the same yardstick. Hester's punt returns have been worth +41.8 EPA. His kickoffs are equally impressive, totaling +42.3 EPA. Throw in his +28.0 EPA as a wide receiver, and you've got a very valuable player with a grand total of +112.1 EPA and counting over five seasons. For comparison, here are some of the other top offensive skill players who also started their careers in 2006: Maurice Jones-Drew +115.1 EPA; Vernon Davis +87.3 EPA; Joseph Addai +73.0 EPA; Brandon Marshall +134.3 EPA; Marques Colston +265.1 EPA; Greg Jennings +241.3 EPA; DeAngelo Williams +52.6 EPA; Santonio Holmes +204.7 EPA; and Vince Young +84.0 EPA. (Notes: These numbers include post-season games. WR numbers can be inflated because by the time the ball is released and targeted to them, several successful events have already occurred on the play.) To put things in full perspective, this season alone several QBs have exceeded Hester's total career EPA. Unfortunately for return specialists, it’s nearly impossible for even the very best to have a Hall of Fame-level impact on a team’s fortunes. That’s the case against Hester, and for that matter, any special teams specialist. On the other hand, Chicago relied heavily on Hester’s 5 touchdowns in 2006 and 6 in 2007 because their offense was relatively weak. Those TDs made the difference in several games, helping the Bears earn a bye and home field advantage in the 2006 playoffs. In conjunction with a lead-leading defense, Hester’s impact is enhanced. Hester also ran back the opening kickoff in the Super Bowl that year, doing his part. Had the Bears won the championship that season, Hester would have been in the running for MVP, and his case for the Hall that much stronger. Further, there’s a case to be made that Hester is deserving simply because he holds the record for return TDs. The Hall of Fame is, after all, not the Hall of Touchdowns or Yards, nor is it the Hall of Passer Rating. It’s about fame, which means whatever we want it to mean. Even if special teams are a small part of the game, shouldn’t the very best be recognized in Canton? Consider this: Brian Mitchell’s previous record of 13 return TDs came over a much longer period. He had 9 punt return TDs on 463 attempts (1.9%) and 4 kick return TDs on 607 attempts (0.7%). Hester’s TD rates of 5.7% and 3.6% dwarf Mitchell’s numbers and soundly beat the best five-year span of his career. 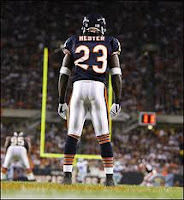 If any returner belongs in the Hall, it would probably be Hester. Ultimately the question isn’t about whether Hester belongs in the Hall. It’s a question of whether any ‘teamer’ belongs there. Maybe it is just perception but it seems that in the last few years that teams have paid more attention to punt and kick off returns. Perhaps someone has the numbers to back this up but have their been more in the last 5 years than in the preceding 5 years? As for whether he should be in the HoF I am not qualified to say. As you say, by what criteria should someone be added; for their contribution to the game, their contribution to a win or simply because they broke a record? Is returning a record number of kick offs as fame worthy as yards thrown or yard run from scrimmage? I will be interested to read everyone elses thoughts. Ack, I meant more kick of and punt returns for large yardage/touchdowns in the last 5 years. Sorry, I need to proof read more before hitting submit. I think this is a nice attempt to take a balanced look at Hester and other specialists as HOF prospects. I don't think it's fair to compare Hester's statistics without touchdowns to the league average return, which of course includes touchdowns. Saying all Hester can do is return kicks for touchdowns is like saying all DeNiro can do is act. I think a better comparison would be between Hester and other top returners, with their longest 14 runs removed. Also, I think the EPA comparison should be between Hester's kick returning EPA and the EPA of other kick returners. As you point out, the statistic favors some positions over others. But I think the analysis here is a great start and goes a long way on the subject. Can't wait to see more! "Is Devin Hester Worthy of the Hall of Fame?" With only 5 years of output? absolutely not. If he continues his production for another 5-10 years? absolutely. One of the problems I have with any returner making it is the selection process coaches use to put players on special teams. The (perceived) injury risk present for the return men causes coaches to withhold players from special teams that have too much value on offense to risk for a fairly inconsistent, small advantage. Hester may still be the best returner even if we had enough return data from Chris Johnson, LT in his prime, Barry Sanders, etc. ... though I'm certain the value Hester adds would be muted. What about Hestor's effect on teams that try to punt out of bounds to avoid him? Could that have an effect on the Bears' opponents' Average net punt yards too? The EPA numbers would include effects like that. One thing you don't factor in is the field position the bears gain just by having him on the field. On KR even if he doesn't touch the ball they will often kick short and try to contain. This is one of the reasons the bears year in and year out are at the top of the league in average start position. On punts, it's not really fair to say he's "an average returner" when he doesn't score. Take the minnesota game for example. He only had 2 chances to return and took one of the house. Its just not fair to equate his impact in the terms you seem to be trying to. Every week the opposing team has to game plan for him and they likely spend more effort on him than you do on a typical returner. Its similar to the lengths teams go to when preping for Vick at QB. Now whether or not Hester is a HoF candidate is a different story. At the moment, I would agree he's not. He's a great kick returner but many great kick returners have been left out. However, if he can find a role on offense and continue to do what he's been doing then yes he is. An average WR and the best returner ever is HoF worthy. Like I just mentioned, his EPA accounts for that. Thanks. I didn't realize that Hestor's EPA on returns included plays in which he did not touch the ball. I wonder what the EPA/return is for Hester compared to other Bears' during Hester's career. Manning and Knox have both been good at returning kicks, and I wonder how much of Hester's "ridiculousness" is due to an excellent special teams unit. If the HOF voters would ever consider a special teams coach (they won't), Toub could make an excellent candidate. First, love what you do and rely on your site often for my own analysis (e.g., http://skinsanalysis.blogspot.com/2011/09/tim-hightower-how-excited-should-we-be.html). Ok, to my question. I've been thinking about the value of punt returners because of the Redskins' decision to keep Brandon Banks on their roster. When one team has an elite punt returner, the other team tends to punt the ball away from them, often out-of-bounds. Presumably this reduces the net distance that punts set a team back. You seem to mention that this is included in the EPA for punt returners. How do you do this ... do you base the outcome of each punt on where the ball was punted from rather than where the ball was fielded? Also, do you have a list of EPAs and/or WPAs for returners somewhere? No, I don't have a list for every returner. It's just by team, but I can pull out specific guys by doing an individual search. The EPA values for short punts due the deterrent effect, as you described, is accounted for simply because punt EPA is only dependent on 2 things: the line of scrimmage of the punt play and the resulting field position after the play. 1) what is the value added for the kick/punt return slot compared to other slots, and then we can judge for ourselves whether the roster spot is warranted? 2) what is the value added for the kick/punt return slot compared to another possibility such as emergency 3rd QB? of course, there is the annoying rule-change on kickoffs that will result in lots of touchbacks and complicate the analysis. i don't think we can use the old days of 35-yard-line kickoffs as a basis for comparison because it appears that kickers have stronger legs present day and can routinely achieve touchbacks if they want. Given that Hester has scored a large amount of the special team touchdowns what happens when you recalculate the league averages without Hester's scores? I.e. A all but Hester TD on kick returns average.